Apple apparently is testing some changes to its App Store ranking algorithms, TechCrunch reports, citing several posts signed by app analysis companies. From what Fiksu has noticed so far, new factors such as app ratings and user engagement will affect the application’s ranking, which could prevent any artificial inflation of rankings. The first changes were spotted by Fiksu back in July, when it noticed that apps unexpectedly shifted positions, without a corresponding increase or decrease in downloads. In late July, we first began to notice apps unexpectedly shifting position without a corresponding increase or decrease in downloads. Upon closer inspection, we discovered these position changes correlated with the apps’ ratings. As evidenced by the graph below, apps with ratings of 4 or more stars received a rank boost in late July and have maintained that rank throughout August. Poorly rated apps with less than 3 stars received the opposite treatment about two weeks later, dropping off precipitously in rank and staying that way. 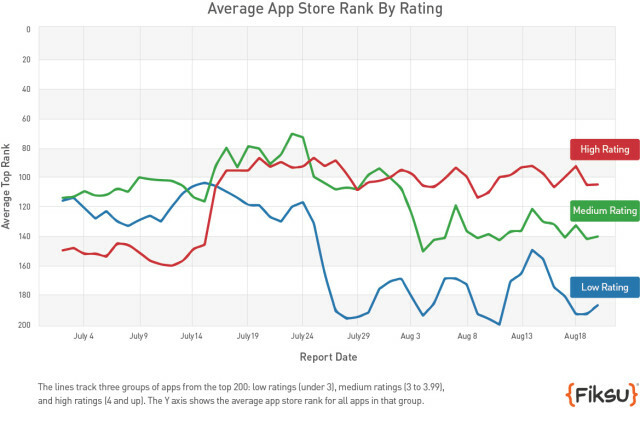 Average rated apps, between 3 and 4 stars, suffered a slight degradation in rank but have generally been less affected. Until now, there are two main factors that influence an app’s App Store rank: download volume and velocity of those downloads. In other words, if you wanted to see your app ranking high, you needed to have tons of downloads within a short period of time. But this wasn’t enough: to maintain this rank, you needed to have additional downloads as well. Another major shift also noticed by Fiksu during the past couple weeks: App Store positioning now updates every three hours instead of every 15 minutes. A powerful addition — under testing now — is the introduction of the user engagement factor into the App Store ranking algorithm: time spent in apps, the number of apps and ongoing usage would help Apple to have the best apps in the front line of its storefront, instead of spammy apps. The changes notices by Fiksu were spotted by other app analysis companies as well: TechCrunch cites MobileDevHQ, SearchMan, and AppsFire, which also point to some changes in the ranking algorithm. 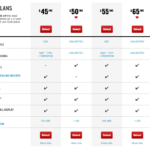 It remains to be seen, though, if Apple will implement the aforementioned changes or is just experimenting.